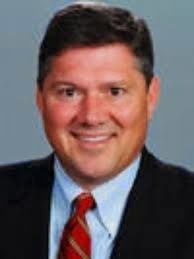 A Disgruntled Republican in Nashville: Bill Freeman: I intend to fight for Davidson County when it comes to jobs and development. Bill Freeman: I intend to fight for Davidson County when it comes to jobs and development. Candidate for Mayor Bill Freeman spoke to a group in Belle Meade today and explained his disagreements with the Chamber of Commerce. I was not at the event but got an advance copy of the speech he delivered. I am very impressed. For a very long time, I have had the same opinion he articulated today. Our taxes are higher than the surrounding counties and yet we provide the amenities that make Nashville a great place to live and yet much of the new development and property taxes and sales tax goes to the surrounding counties. I think Bill Freeman hit the nail on the head with this speech. 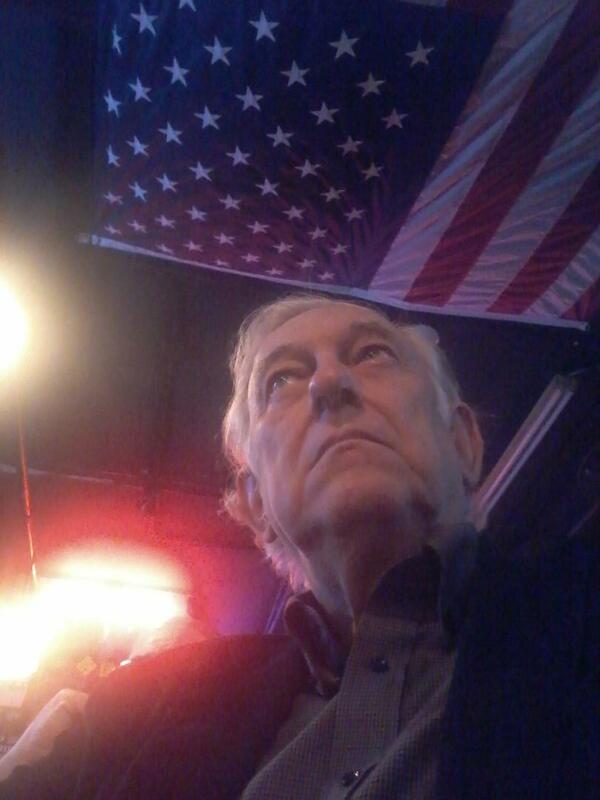 As I score the candidates and decide who I will support for Mayor, Bill Freeman just gained a few points. I commend him for issuing a specific policy paper, laying out a well-crafted and documented argument. I want more than sound bites and platitudes and applause lines from a candidate. I hope other candidates will follow suit with detailed position papers on the issues facing our city. Thank you so much for having me here today. Today, I want to talk about my vision for the future of Nashville and the role each of you can play in that vision. But, first, I want to take you back some 30 years ago. I remember it like it was yesterday. My business partner, Jimmy Webb, and I had just gone to the bank and borrowed $15,000. We had one employee, one building and a big dream. Thanks to this great community … our dream became a reality. We’ve built an award-winning company with almost 500 employees that has earned national recognition for environmental sustainability and has been named three times as one of the best places to work in Nashville. We had a dream … just like so many of you in this room have a dream. You all want what everyone in Nashville wants. A strong community where you can live and work and play. A growing community. A place of opportunity. But a dream without work … is just a dream. Those of you who are gathered here today are the backbone of our future … the doers … the risk takers … and you get up on mornings like this, you come to work and you make your dreams come true … one long hard day at a time. The next Mayor of Nashville must be prepared to make the important decisions about the kind of city we are going to be in 10 years or 20 years. The next mayor must be the kind of person who gets up on mornings like this, goes to the courthouse, and fights for the future … just like you do. I want to be that next Mayor. I think our leaders in Nashville … in business, government and education … need to have our eyes firmly on the future. But, we need to understand and remember what made Nashville great. Our great communities, great schools, great people … music, business and education. We also need to innovate and meet the challenges of today and the future with creativity and determination. Nashville needs dreamers and doers. Dreamers to challenge us and make us better. Doers to make the art and music … to build the buildings and houses … to teach our children. I think we should have a city government that aspires to greatness … that’s the kind of leadership I will offer as mayor. Ladies and gentlemen … Nashville was not built by cautious people. I’m different. I don’t have a cautious vision for Nashville’s future… I have a bold, aggressive vision for the future and over the coming weeks and months I’m going to make clear to you and to the people of this city why I should be mayor. To be sure, there are beliefs that all the candidates share. We all support better schools, mass transit, safe communities. But just saying that doesn’t make it a reality. Our next mayor must be willing to dream big dreams … and then get up in the morning and do the work. I realize that schools and transportation are the top issues that most people care most about. But making our schools better and solving our transportation problems are exactly why we need to recruit jobs here because that grows the tax base which supports our schools and allows us the freedom to improve our transportation infrastructure. And speaking of jobs, I’d like to talk about something that is very important to me in this Mayor’s race. Much has been made, in some circles, about my comments so far in this race about the city’s relationship with the Nashville Area Chamber of Commerce. I want to expand on that a bit today … since you are generously giving me more than one minute to answer a question. First, I want you to understand, I am a product of the Chamber of Commerce. My business partner and I met in the Junior Chamber. Our first banker and lawyer came from the chamber. We found the printer to print our letterhead through the Chamber. I also believe the Chamber of Commerce does great work in this community. I am a big fan of the Chamber. I’m a big fan of Ralph Schultz, the leader of the Chamber. But there is one area where we differ. As mayor, I will be a jealous advocate for Davidson County when it comes to job creation IN DAVIDSON COUNTY. Not Wilson County. Not Rutherford County. Not Williamson, Cheatham, Robertson or Sumner. I am not running for Mayor of Middle Tennessee. I want to be Mayor of Nashville. And you can count on me to fight for jobs in Davidson County. While we are excited for our neighbors and enjoy seeing our entire region thrive, Nashville is left “carrying the water” and footing the bill to a large degree for the entire Middle Tennessee region’s growth and prosperity. When businesses and corporations move their operations to an area just outside of Davidson County, it is not the people of Nashville that are seeing the benefits of additional tax revenues, it is our neighbors. 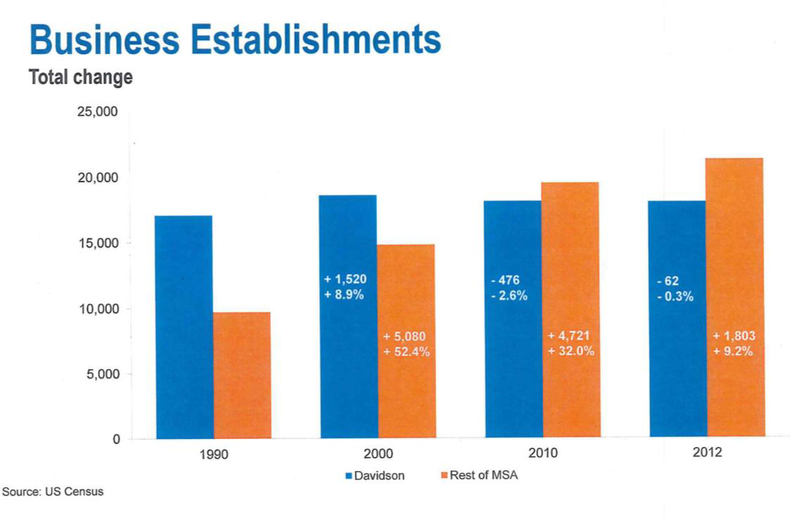 Let’s just take a moment and put this in context with some charts that I got from the Nashville Chamber (Chart showing Business Establishments) In 1990 Davidson Count drove the region in business establishments. Today, over 20 years later that has completely reversed. Our neighbors are getting a great deal and they know it. That was made clear when the mayor of a city in one of the counties bordering Nashville recently said that, as long as Nashville will allow this to happen, they would be grateful to be a bedroom community and will continue maximizing all the advantages that come with that. Let’s take a look at employment growth differences. (Chart of Employment Growth Differences) It does not get more obvious than this. 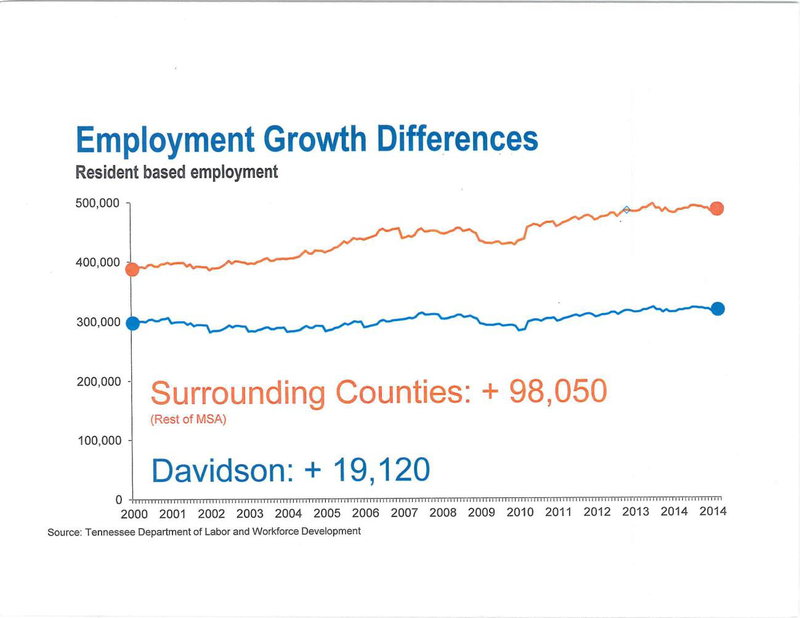 The surrounding counties enjoyed growth of almost 100,000 new jobs while Davidson County barely added 20,000. This is an alarming trend. As our neighboring communities take advantage of all that Nashville offers, it is still the citizens of Nashville that are paying for, building and maintaining these world-class venues that first attracted these new businesses to the region. The people of Nashville are the ones paying for the increased demands for infrastructure. In 2014 alone, Davidson County’s estimated cost for highway projects is $1.13 billion. It is the emergency rooms at Nashville’s hospitals that care for the sickest of the sick and the Nashville health facilities and clinics that are caring for the 19 percent of the population that is uninsured. 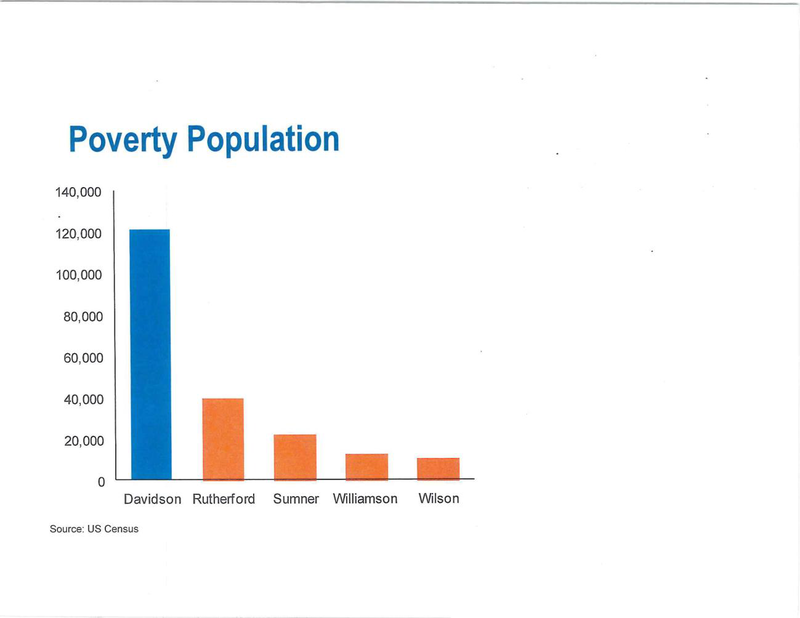 And when you look at (Chart of Poverty Population) where poverty is concentrated in the region, Nashville has a larger concentration of poverty—0ver 120,000—than the other 4 counties combined—90,000. The people of Nashville are the ones paying for a police force to protect our city, keep our roadways safe and keep the venues that are so popular to out of town visitors a safe place to visit and have a good time. To tie it all together, it can be pointed out that by those businesses locating just outside of Nashville puts additional strain on Nashville’s essential services and other major issues of the campaign, like education. I had a meeting with Dr. Register and he told me that over 140 languages are spoken in Davidson County schools. This what makes Nashville great—our cultural diversity. But it also shows the real challenges of educating these students with English may be a 2nd or 3rd language. A tough burden on the system. As people move to the edges of Davidson County to live, but drive to their work place outside of the county, Nashville is getting used, especially as more residents rent instead of buying and therefor pay property taxes. We pay for the roads, health care facilities, education, etc…. and our neighbors collect the taxes. 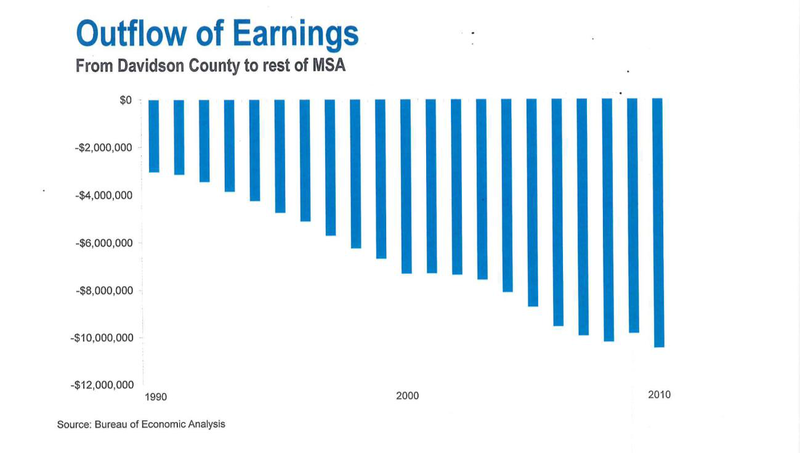 As this chart so dramatically shows (Chart of Outflow of Earnings from Nashville to MSA) just look at the “outflow of earnings” from Davidson County to the surrounding MSA since 1990. 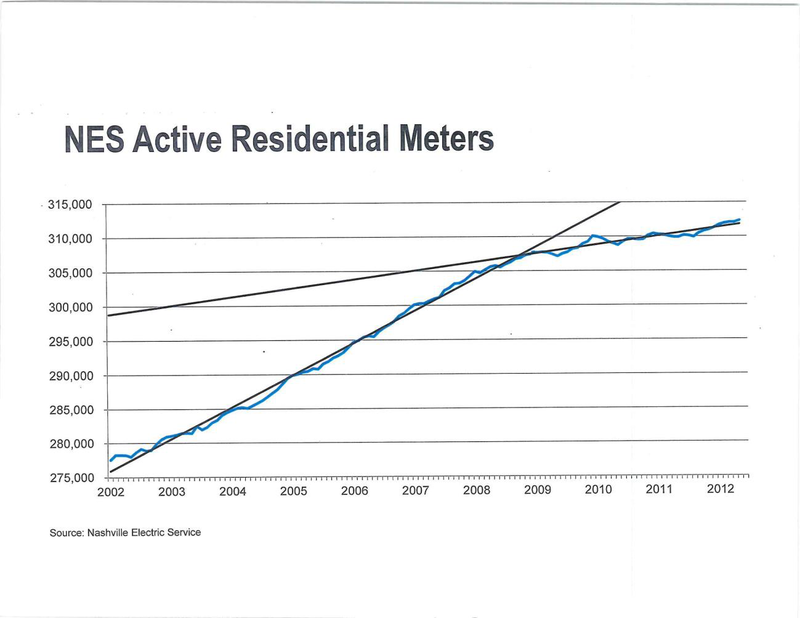 And what concerns me most is the trend (Chart of NES Active Residential Meters—Flat-line Growth) seen in this chart of how we are moving towards “flat-line” growth in Nashville. While Nashville still feels like the “It City” and that nothing can stop us or slow us down, there are the beginnings of alarming trends that if they continue and accelerate could well see the “bloom off the rose” in Nashville’s future. 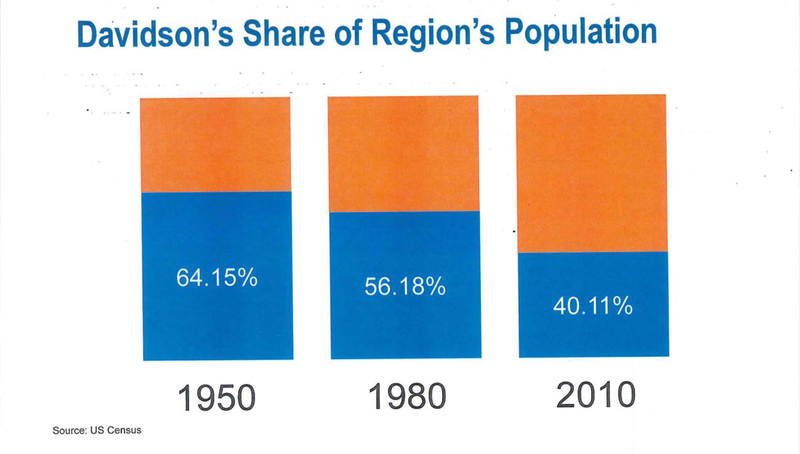 And finally, this chart (Chart of Davidson’s Share of Region’s Population) shows dramatically how Nashville’s share of the region’s population since 1950 has dropped dramatically. And these are 2010 numbers. What is it today? 35% of less? I realize that schools and transportation are the top issues that most people care most about. But making our schools better and solving our transportation problems are exactly why we need to recruit jobs here because that grows the tax base which supports our schools, allows us the freedom to improve our transportation infrastructure and provides the funds we need to protect and improve the quality of life in every neighborhood of Davidson County. I’ve been somewhat amused by the response to my comments. I’ve been called an isolationist by some. Not true. There are certain areas where the region should cooperate. Mass transit is the biggest and most obvious place where we should cooperate. If we want Nashville … and the region … to grow and prosper we must have a meaningful, long-term plan for mass transit. But when it comes to jobs … we are competitors. The point of competition is to win. I intend to fight for Davidson County when it comes to jobs and development. I intend to win those fights. If we occasionally lose one of those battles … I will tip my cap to the winner … and get back out on the field more determined to win next time. That doesn’t mean I’m picking a fight with the Chamber of Commerce. As I said earlier, I am a fan and admirer of the Chamber and its leadership. I just think this is one area where the responsibilities of the Mayor of Nashville and the Chamber will from time to time diverge. Frankly, I would like very much to have the support of the Chamber … but I’m not willing to bend on this issue to get their support. I suspect some of the other candidates are willing to tell the chamber … at least privately … just help me get in there and then it will be business as usual. I won’t do that. As we move forward in this campaign I’m going to continue to point out where there are differences between me and the other candidates. I know them all. I like them all. They are good people. I just think I will be a better mayor. I will be ready on day one. Ready to fight for Nashville. Ready to make our schools better. Ready to tackle the tough jobs like mass transit. Ready to listen. Ready to lead. As I close here and we get to some questions, I want to tell you a story. I’m just a guy from Donelson who has lived the Nashville version of the American Dream. Grew up in Donelson. I walked to school. Walked to Church. Walked to go fishing in the Stones River. Went to public schools until high school. Graduated from USN. Then came home from college to work in our family business for a time. Left and worked for a time with MDHA and then Jimmy Webb and I started Freeman Webb 36 years ago with one apartment building, one employee and a big dream. I’m proud of that … but I’m still just a guy from Donelson who worked hard and lived the American Dream – and I’d like to be your mayor.